And Eli don't like Anybody very much. This is the second in a series about such issues. Recently, overblown results from a FACE experiment (high CO2 growth conditions in fields) stirred up a desert storm about weather (yes Eli does like puns, even bad ones, thank you very much) the Amazon would turn into a desert within the decade. Hiding behind this are a series of Hadley Center studies where carbon cycle models were coupled to climate models that show increasing greenhouse gas concentrations will turn the Amazon into very different place in the century. Amazonian temperature rises by more than 10L pver the 21st century, and rainfall drops by an alarming 64%. Together these changes lead to a 78% loss in vegetation carbon and a 72% loss in soil carbon. By contrast, over the same period the global mean temperature rises by about 4K and rainfall increases by 3%. Global vegetation carbon increases by about 10 GtC despite the large losses in South American, but global soil carbon decreases by about 155 GtC. The carbon loss in the Amazon basin of about 50 GtC accounts for 23 ppmv of the total CO2 increase of 600 ppmv over the 21st century, or about a third of the total terrestrial carbon reduction of 145 GtC. Cox, P.M., Huntingford, C. and Jones, C.D., 2006: Conditions for sink-to-source transitions and runaway feedbacks from the land carbon-cycle. In Schellnhuber, H.J., Cramer, W., Nakicenovic, N., Wigley, T. and Yohe, G. (eds.) Avoiding Dangerous Climate Change (Cambridge University Press), Chapter 15, 155-161. Cowling, S.A., Betts, R.A., Cox, P.M., Ettwein, V.J., Jones, C.D., Maslin, M.A. and Spall., S., 2005: Modelling the past and future fate of the Amazonian Rainforest. In Mahli, Y. and Phillips, O. (eds.) Tropical forests and global atmospheric change, (Oxford University Press, Oxford), 191-198. Gash, J.H.C., Huntingford, C., Marengo, J.A., Betts, R.A., Cox, P.M., Fisch, G., Fu, R., Gandu, A.W., Harris, P.P., Machado, L.A.T., von Randow, C. and Silva Dias, M.A., 2004: Amazonian climate: results and future research. Theor Appl Climatol, 78(1-3), 187-193, doi:10.1007/s00704-004-0052-9. Huntingford, C., Harris, P.P., Gedney, N., Cox, P.M., Betts, R.A., Gash, J.H.C. and Marengo, J., 2004: Using a GCM analogue model to investigate the potential for Amazonian forest dieback. Theor Appl Climatol, 78(1-3), 177-185, doi:10.1007/s00704-004-0051-x. "..the demonstrated disagreement between observations and greenhouse models falsifies the anthropogenic global warming hypothesis and argues convincingly that human effects are minor and that natural factors are the main cause of current warming. This explanation fits well with the paleoclimatic evidence for a (roughly) 1500 year climate cycle, observed in ice cores, ocean sediments and a variety of other data"
Oh yes the last comment is flacking for S. Fred's new magnum opus Singer, S. F. and D. T. Avery (2006), Unstoppable Global Warming: Every 1500 Years, 260 pp., Rowman and Littlefield, Lanham, Md. As all the insiders know, the real reason for global warming is a little discussed factor. The ability to anticipate a pattern is not the ability to understand its root causes. Both are useful but they require different skills. Science starts by observing, from careful observation across time or many similar systems, patterns emerge. Pattern recognition is the beginning of understanding because it can be used to predict unobserved things. But pattern recognition has its limits. Pattern recognition is much better at interpolation than extrapolation. It also can result in absolutely weird, but useful ways of dealing with life. Anyone who understands computers knows this when their loved ones explain how they use the danged things. Beyond the amusing and ultimately non functional (A distraught Ms. Rabett on the line for you Professor) pattern recognition can also give you major investments into cold fusion and hydrino science, and even worse a refusal to deal with the viral origin of HIV. Engineers and amateurs are unfortunately prone to such enthusiasms. Give them credit the engineers have invented some really cool tools that empower pattern recognition. Still, over time the organizing principles of the system become clear, either through observation or insights gained in other areas. At that point someone (aka Einstein, Newton, Dalton) states what the basic principles are and shows how you can both understand what is happening and predict what will happen in the future. To do this may require new tools, including mathematical ones such as calculus. You can go beyond theory and become entrapped in the beauty of those simple ideas that explain nothing, thus string theory. The best physicists (ask them) have become entangled in that ball of universes. The shift from observation to pattern recognition and that to basic principles are the tipping points in science. The transition from science to beauty is the tripping point to metaphysics. Different scientific fields have encountered these transitions at different times. The earliest were physical sciences: mechanics, electricity and magnetism. Kepler, Gallileo and others were the pattern recognition forerunners for Newton's synthesis. Faraday, Ampere and Co. did the dirty work for Maxwell. Physics is subject to drastic simplification and was best amenable to this type of change. Chemistry and biology were both pattern recognition sciences until very recently, chemistry until ~1980 and biology just now. Their continuing shift is driven by the explosion of computational capacity. Climate is also at the boundary point between pattern recognition and theory. Here (and in chemistry and physics) a new wrinkle is being added by the availability of computers: the coupling of pattern recognition to improve theory. Meteorology has been a leader in this. Weather forcasting starts with mathematical theoretical models, but assimilates observational patterns into the mix to provide longer range forecasts. Much of the venom in the climate wars occurs on the boundary between basic theory and pattern recognition. And boppin' 'em on the head. I'll turn you into a goon!" To find out how this ends (badly) go hare and hare (even better) and if you want a term paper, hare is a good start and you can get it on Amazon and you can take the bunny home (for a charge) and the Grateful Dead had good taste and your kids can act it out. Ever go to look something up and get the wrong year or page? Some of Eli's best ideas have come from that, but Willis Eschenbach gets the wrong decade, the wrong page, and by gosh the wrong journal. As of 2006, Willis wins the 2004 Douglas Corrigan RTFWR prize. Eli has several posts on Hansen et al. (Fung, Lacis, Rind Lebedeff, Ruedy and Russell playing et and al. on Broadway) J. Geophys. Res. 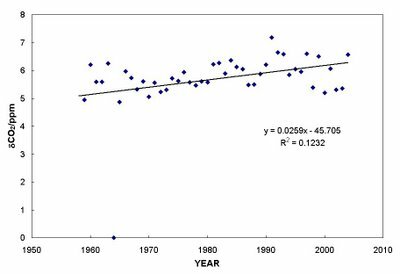 93 (1988) 9341 a somewhat key paper as it predicted the course of global temperatures early on, and wadda u now, did pretty well at it. The results were part of Hansen's testimonies to the US Congress in the late 80s. The basis of that testimony was the GISS climate model and three scenerios, called A, B and C.
A number of foolish people have stuck their fingers up their nose on this. Pat Michaels is famous for having used his eraser to push the predictions of scenerio B and C into the memory hole. Pat, the Holiday Inn climatologist of Virginia, claimed that Hansen had never said that B was the most likely scenerio and that Scenerio A was the one. Rabett Research went and got the paper showing that Pat is either a stone liar or had not RTFR (handy phrase that). First, Eli, take a deep breath and stop trying to insult me. I have RTFR, many times, and obviously much more closely than you have. For example, you keep claiming that Scenario C goes flat in 2000, as shown in this graph on your web site. 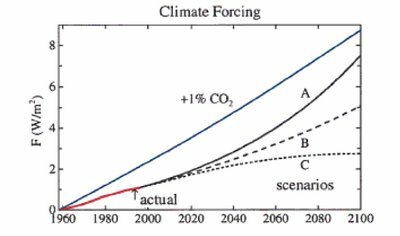 But Hansen clearly states in the FR that the "Slow growth [Scenario C] assumes that the annual increment of airborne CO2 will average 1.6 ppm until 2025, after which it will decline linearly to zero in 2100." RTFR yourself, and then remember your foolish arrogance next time you get ready to claim that you are a prescient lagomorph. Your graph, linked above, is a joke. 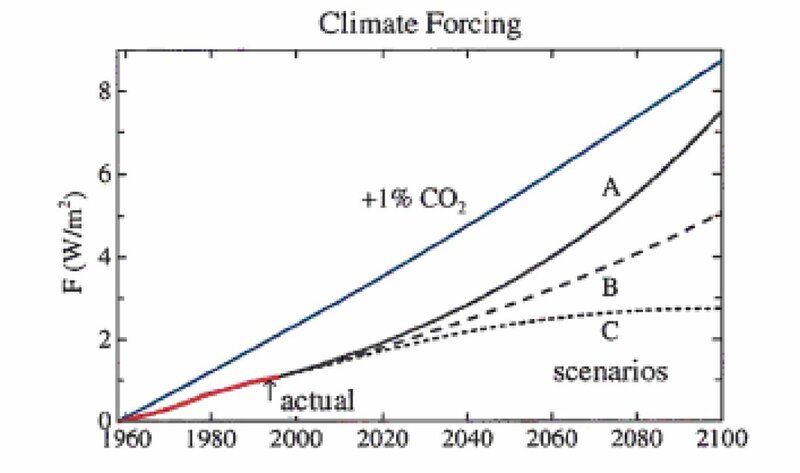 It shows less than one ppmv difference between the CO2 levels in the three scenarios except for your mistaken flattening of Scenario C in 2000. Think about it, Eli. Do you really believe that Hansen went to all the trouble to create three separate CO2 scenarios that would only differ by 1 ppmv after a run of fifty years? Get real! 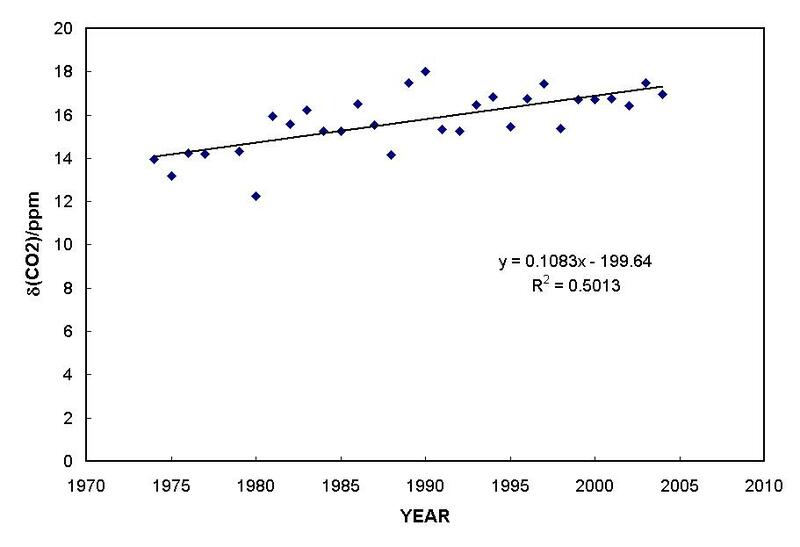 So the mechanical bunny went and got the 1998 predictions for CO2 forcing (top figure). You can see how the CO2 forcing matched up with the data in an earlier post. Spot on. Sorry Willis. 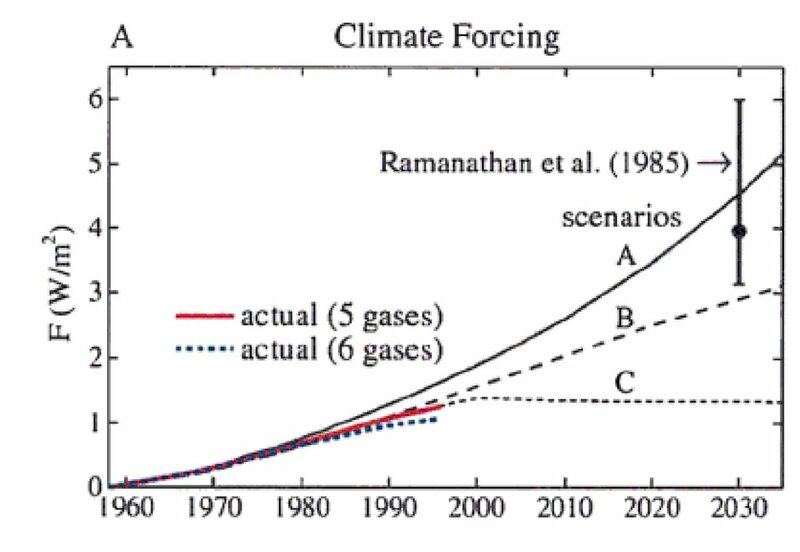 Hansen, et al, went to all the trouble of creating a series of three scenerios that would not differ by 1.5 ppm in 42 years because a) they had data from 1958 to 1987 and one does want to match reality in all three scenerios and b) they wanted to make realistic short term predictions. 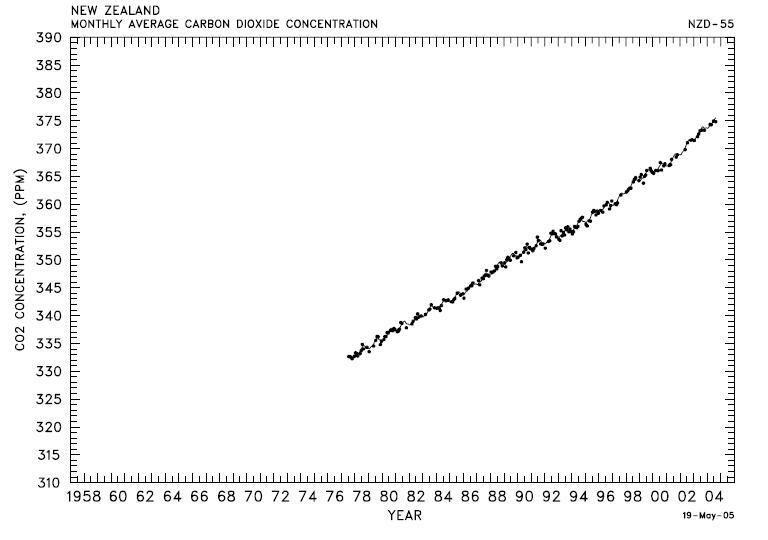 The CO2 forcings start diverging in 2000. It is true, that if you look at the words, the CO2 mixing ratio growth in Scenerio A is exponential and in B it is linear, a favorite distraction of an unworthy competitor, but one should not fall into the well known fallacy of Pielke. Remember class, for small changes (10-20 ppm in 300) a linear change closely approximates an exponential one. Honest Jim Hansen being the sportsman he is shows the rubes part of the machinery. 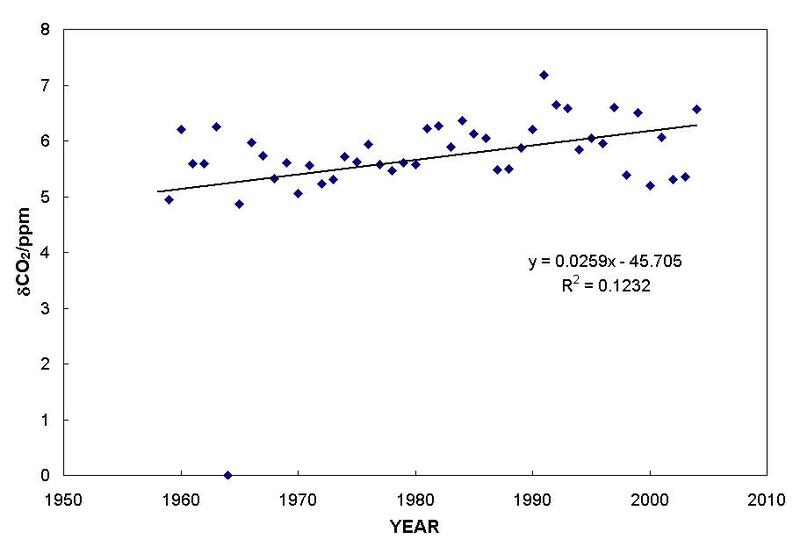 Forecast temperature trends for time scales of a few decades or less are not very sensitive to the model's equilibrium climate sensitivity (reference provided). Therefore climate sensitivity would have to be much smaller than 4.2 C, say 1.5 to 2 C, in order for us to modify our conclusions significantly. Wacki asked whether I refer to me in real life as you. This is actually a profound question having a lot to do with this blog. When I decided to step back from real life in virtual media a major reason was that me as me had feelings and people and things I cared about. The real me can be very much that way. Eli on the other hand is a six foot pookah who has a charming way with technology and the bunnies. (I have no objection that he is taller than I am). You can't really insult a fuzzy, and anyhow Rabetts have a hard time taking any insult seriously. After all if some bozo or bozette wants to waste four letter electrons on reaming out an imaginary creature, why should I as me do anything but smile. Eli, he just pulls out another carrot. On the other hand Eli does not have to tell any social lies either. Makes for a much better life. I just finished reading The College Administrator's Survival Guide, by C.K. Gunsalus (Harvard U Press, 2006), and I'm utterly taken with it. Gunsalus gets so many of the details right, and in such an unpretentious way, that I expect to keep it around as a reference. Victim bullies thrive in the no-man's-land created by the deadly combination of slow and cumbersome processes, and failure of managerial nerve. Because defeating a victim bully takes tremendous endurance, most people don't try. Victim bullies know this, and are able to intimidate others into leaving them alone to do pretty much as they please. A theme of those that disrespect the IPCC and global climate models is that all climate is local and that the models are useless for discussing local events. Now come Kumar, Rajagopalan, Hoerling, Bates and Cane in Science, 314 (2006) 115 to show that indeed, local climate is global, or more accurately global effects on local climate can be controlling. The 132-year historical rainfall record reveals that severe droughts in India have always been accompanied by El Niño events. Yet El Niño events have not always produced severe droughts. We show that El Niño events with the warmest sea surface temperature (SST) anomalies in the central equatorial Pacific are more effective in focusing drought-producing subsidence over India than events with the warmest SSTs in the eastern equatorial Pacific. The physical basis for such different impacts is established using atmospheric general circulation model experiments forced with idealized tropical Pacific warmings. Changes in El Nino driven by global climate change will change the monsoon and thus the lives of everyone everywhere on the Indian subcontinent. Isaih Berlin, a rather overrated mid-twentieth century philosopher, talked of two kinds of thinkers, the fox and the hedgehog. The fox knows many small things, the hedgehog only one big one. To abuse this political simile, greenhouse gas concentration is one big thing that moves the entire climate system in one direction. Local effects are many small things that move the system, in one direction and then the other. For local effects to overcome the push from the global greenhouse gas forcing all the local effects must go in one direction, but how likely is that? The central limit theorem is a good guide. Any sum of many small randomly distributed forcings will tend towards zero. Even if the local forcings are controlling locally (whatever that may mean), when you average them over the globe, the net effect will tend to zero if the local forcings are randomly distributed. Eli has foolishly scheduled a delightful weekend reviewing proposals with Fastlane and the guys. The charming Ms. Rabett has named her price, and oh, the things we do for science. To entertain the blogging masses we have scheduled a musical interlude. We start with Tom Lehrer's well known Song of the Elements complete with Mike Stanfill's delightful Flash visuals. Who says that chemistry can't be fun. Followed by Flanders and Swann mp3 take on Thermodynamics (text here) recommended to all students of the boring arts. Something more visual. And, finally a very, very nerdy place. It had come to management's attention here at Rabett Run, that various and sundry climate change denialists** are unhappy being called climate change deniers. One can see their point. Deniers, are but the unhappy dupes of the much smarter and well read professional denialists, who make it their mission to sow confusion. Thenceforth we pledge to make the proper distinction. Inhabitants and visitors to various climate science obsessed blogs have noted the recent controversy about calling climate change denialists denialists. As James Annan points out this is an Amen Chorus, which originated in London, but like the wave in a stadium, is propagating to the rather peculiar corners of the world, Australia, England, California, and, wait, now flys Ethon** into my den with news that even in view of the snow covered mountains of Boulder, Colorado great umbrage is being taken. You would think they had better things to do out there, like wait for the snow to fly and the skiing to start. For the plaintiff, we have the well know commissioner of the language police and climate debate, Roger Pielke, Jr., himself. Let's be blunt. The phrase "climate change denier" is meant to be evocative of the phrase "holocaust denier". As such the phrase conjurs up a symbolic allusion fully intended to equate questioning of climate change with questioning of the Holocaust. Let's be blunt. This allusion is an affront to those who suffered and died in the Holocaust. Let those who would make such an allusion instead be absolutely explicit about their assertion of moral equivalency between Holocaust deniers and those that they criticize. This allusion has no place in the discourse on climate change. I say this as someone fully convinced of a significant human role in the behavior of the climate system. As many in the comments in that place which cannot be named, point out climate change denialist is an accurate description that has nothing to do with the Holocaust. They speak for themselves, but I would like to point to the best response I have seen, from Michael Tobis on the google group, globalclimatechange (see how to join on the right hand side). Denialism does not have as its purpose a denial of warming. It is the denial of necessity for a policy. Its weapon is diversion. It diverts the conversation to minutia of the science. Its objective is to divert the scientist from summarizing the situation effectively, to divert the casual reader from making the effort to understand, and to leave the casual reader with the impression of a subtle controversy even where the facts are entirely clear and rather straightforward. Among its tactics is a reliance on the good nature of the scientist, who loves to make every effort to explain and explore scientific knowledge, and in many cases believes himself or herself obligated to do so. Why is the issue being raised? Why is the issue being raised now? As an exercise in research on symbolic politics, I'd like to use this thread to see if we can collectively track the exact origins of the phrases "climate change denial" and "climate change deniers". The issue is being raised because denialist is the most powerful and terse description of those who deny anthropic climate change. It is a negative description. As Tobis points out, denialist is an accurate description. There is NO comparable term to describe those who worry about climate change driven by human emissions of greenhouse gases, or indeed those who worry about other environmental problems. The rhetoric the denialists have used to describe their opponents seeks to belittle, but because it does so, the language is childish. Lifting a few from various places, we get Green Stalinists, Climate Catastrophists, Radical Environmentalists, Green Fanatical Moron and it goes rapidly downhill from there. A good analogy can be found in the Abortion Wars. Those who would outlaw abortion, call themselves Pro-Life. Those who would allow abortion have stuck themselves with the rather strained Pro-Choice. The asymmetry in clarity and image of the LABELS has been of great advantage to those favoring outlawing abortion. RPJr is a POLITICAL scientist. He knows that the term "climate change denialist" shifts the PUBLIC debate towards those who hold with the IPCC consensus and believe that public policy should be based on it. This is the answer to why. Where Pielke's interests lie is interesting. As with all questions of motivation, one is best advised to look at what people do, not at what they say. The answer to why now, is also simple. Ten years ago, the evidence for human influence on the atmosphere and climate was strong, but not extremely so. Enough then to justify no cost policies, which also were strongly opposed by the denialists wearing the cloths of skeptics, but probably not enough for stronger action. It was reasonable to assign skepticism to those who had strong reservations at that time, even though several of them (Singer, Michaels, Seitz, Baliunas, et al.) had strong political motivations and were being supported by political interests. Still, within the climate science community, they were then perceived as members of the group, perhaps with odd opinions on some things and their political connections were not known or ignored. As the evidence strengthened, the assumption of skepticism has become no longer tenable. Increasingly denial is seen for what it is and called out with increasing frequency over the past few years. This is uncomfortable for the denialists, so they are trying to eliminate the description from polite conversation, thus why now. As was discussed in an earlier post adaptation has immediate benefits both temporally and locally. The benefits of mitigation, on the other hand, will take a long time to emerge and will not be obvious everywhere. Thus a policy which achieves substantial mitigation coupled to immediate local benefits is a good thing. First because diffuse sources such as automobiles and home furnaces will have to become more efficient to meet such requirements. Second because coal will become a much less used fuel as the cost of cleaning up the emissions rises.. Thus the virtue of unintended Lomborgianism. There is an apples and oranges issue though which is often missed. SOx, NOx, Hg, O3 have short residence times in the atmosphere. The effect of any particular packet of emissions only lasts for a few years . Adding excess CO2 to the atmosphere now(and yes it is a pollutant in large enough doses) has effects that lasts for centuries. If you want a medical analogy, the former are poisons, the latter causes cancer. The pros and cons of the survey method are being discussed elsewhere. Unfortunately mostly by the clueless and opinionated. However, as pointed to by Tim Lambert, Eli wants to reproduce a comment from Healing Iraq. He has taken the liberty of changing five or so words. One problem is that the people dismissing – or in some cases, rabidly attacking – the results of this study, including governmental officials who, arguably, have an interest in doing so, have offered no other alternative or not even a counter estimate. This is called denial. When you have no hard facts to discredit a scientific study, or worse, if you are forced to resort to absurd arguments, such as “they are all lying,” or “they interviewed communists,” or “the timing to publish this study was to affect American elections,” or "I don't like the results and they don't fit into my world view, therefore they have to be false," it is better for you to just shut up. From the short time I have been here, I am realising that some Americans have a hard time accepting facts that fly against their political persuasions. In EVERY way it IS denialism. A team at the Danish National Space Center has discovered how cosmic rays from exploding stars can help to make clouds in the atmosphere. The results support the theory that cosmic rays influence Earth’s climate. An essential role for remote stars in everyday weather on Earth has been revealed by an experiment at the Danish National Space Center in Copenhagen. It is already well-established that when cosmic rays, which are high-speed atomic particles originating in exploded stars far away in the Milky Way, penetrate Earth’s atmosphere they produce substantial amounts of ions and release free electrons. Now, results from the Danish experiment show that the released electrons significantly promote the formation of building blocks for cloud condensation nuclei on which water vapour condenses to make clouds. Hence, a causal mechanism by which cosmic rays can facilitate the production of clouds in Earth’s atmosphere has been experimentally identified for the first time. But actually folks, that was not what the paper was about. That was the press release. I guess it is time to call out the very proper science police. We will send Ethon to notify Officer Pielke who is currently on denial detail. UPDATE: It occured to the old hare that he needs to use a hammer. Everyone accepts that cosmic rays are the principal source of ions in the lower atmosphere. The ion density is around 1000/cm3. Is the availability of ions the limiting factor in forming cloud condensation nuclei or is the availability of other species limiting. Are there other ways of forming cloud condensation nuclei (CCN) besides around ions and if so (it is so) what is the relative importance of each type of CCN and what are the characteristics of the CCNs. However, experimental investigations exploring the role of ions in particle production are scarce and often at conditions far removed from those relevant for the lower part of the atmosphere. 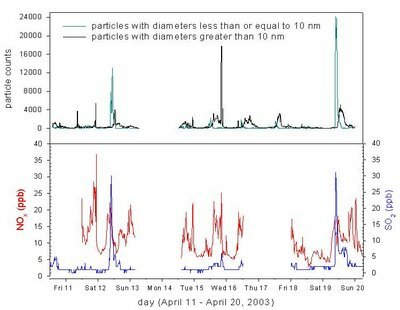 Here, we show that the production of new aerosol particles is proportional to the negative ion density under experimental conditions similar to those found in the lower atmosphere over oceans. Unfortunately their conditions are far removed from the lower atmosphere. Maybe as far as Venus, but even there Sadly No. The apparatus is a fairly large smog chamber. Smog chambers have been extensively used to study atmospheric chemistry, especially, surprise, smog. They are very large, so that wall effects can be minimized. They have deep UV light sources to initiate photochemistry, most often mercury lamps emitting at 254 nm, arrangements for moving gas through the system and probes for whatever. The foul mix flowing of Denmark included a relative humidity of 2-90%, no problem there, 5 ppm of SO2, and a whole lot of ozone. The Danes had the ability to monitor the concentration of O3, but it is not given in the paper. Oh, yes, a fair amount of 254 nm light. Anyone with half a clue, any experience of 1950 London, 1960 LA or Mexico City anytime can predict what happened. The balance of the air, was air. UPDATE: At Real Climate Martin Enghoff, an author of the paper under discussion, states that the SO2 5ppm mixture was diluted in the experiment down to 80-230 ppt, and that the ozone concentration was also diluted to 20-40 ppb. This was not stated in the paper, but fair is fair. A question that remains is how much UV light entered the chamber to create OH concentrations. Normal OH concentrations are of the order of 10^6/cm3. (In the atmosphere there are ~2x10^19 molecules/cm^3). SO2 oxidation requires OH radicals, so the rate will depend directly on the amount of OH. 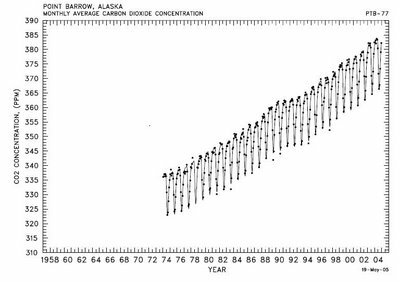 Average tropospheric and stratospheric SO2 concentrations are below ppb (100 ppt) levels. Oceans emit dimethylsulfide (DMS) and not much SO2. The Danish gas chamber ~5000 times more SO2 than places where clouds form and maybe 300 times more than polluted place on the planet outside of a fairly nasty volcano or anwhere near E after he has had his cabbage. Ozone, them Danes have more ozone than in the ozone layer for sure and like huge amounts more than you find in the troposphere. UV light, well, thanks to the ozone layer there ain't no damn 254 nm in this town sheriff. You can look up the rates of these reactions at the NIST Kinetics web site (warning, this is kind of the Wikipedia of reaction rate constants, there is no evaluation attempted) or look at a critical evaluation. There is also heterogeneous chemistry going on on aerosols and the walls of the chamber. The obvious result is that when ozone goes above 5ppb lots of small aerosol particles form. So what is limiting in the real atmosphere is SO2, and almost certainly OH/O(1D). Let us recap. Svensmark, et al studied the formation of aerosols in a smog chamber rich in OH and SO2. In fact the concentration of these species was three or more orders of magnitude higher than in the troposphere and stratosphere. UPDATE: See update above. The SO2 concentration was high, but not out of the range of normal. They varies the number of ions in the chamber and observed that more particles formed when the charge was increase. Oh yes, I have some arguments with their proposed ion chemistry, but we will save that for another day. 15. In the further alternative, and in answer to the whole of the Statement of Claim, says that the plaintiff failed to comply with the requirements of section 13 the Defamation Act R.S.A. 2000, c. D-6. The defendant Johnson was not given notice in writing of the plaintiff's intention to bring an action against the defendant Johnson. If the defendant Johnson receive such a notice (which is not admitted but denied) it was not served in the same manner as a statement of claim. (1) The defamatory matter has come to the plaintiff’s notice or knowledge, given to the defendant, in the case of a daily newspaper, 7, and in the case of any other newspaper or when the defamatory matter was broadcast, 14 days’ notice in writing of the plaintiff’s intention to bring an action, specifying the defamatory matter complained of. (2) The notice shall be served in the same manner as a statement of claim. ... i.e. the pro forma threatening letter, was sent to both parties - in response to which the Herald wrote the clarification crediting Ball with 50+ "publications." at which point Eli sent back his suitably framed law degree that he had polished up to show to Mother Rabett. ... we have it on good authority that notice was served well within the allowable time limit. As they say, nevermind. Gotta stop going to the Holiday Inn. In the interest of keeping things clear I am taking this post down. Ask not for whom the bunny qvells. In another dog who did not bark moment we have not heard much about the report from an IPCC commissioned meeting on "Scientific assessment of the inter-relationships of Mitigation and Adaptation" by Saleemul Huq and Michael Grubb published in August 2003. (Seems to have vanished, but at least for now it remains in the Google cache). What are the main relationships between adaptation and mitigation (at different levels)? To what extent are trade–offs or combined strategies (at national level) possible? How could the issue be structured in AR4? What expertise would be required for AR4? Eli is quite happy with this paper as it beats on a drum that he has made his own, that both adaptation and mitigation strategies will be necessary. 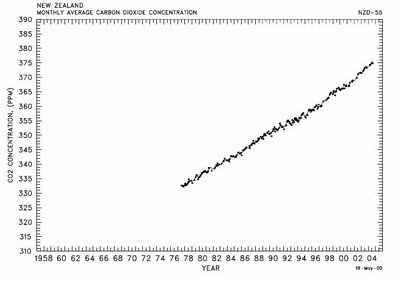 Atmospheric concentrations of greenhouse gases are already well above pre-industrial levels, and are projected to continue rising rapidly. The SAR and TAR confirm that signs of climate change are already being seen above the noise of natural variations. 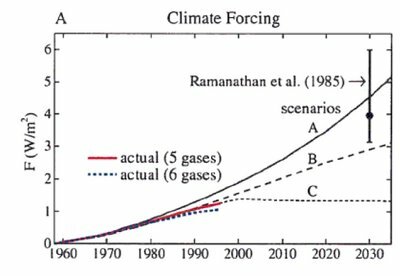 Most scenarios, even with strong mitigation measures, project that overall GHG concentrations (including non CO2 gases) will rise above a doubling of pre-industrial levels. As indicated in Figure 2, drawn from the TAR, the associated temperature changes will take us significantly into the ‘risk zones’ of impacts on ecosystems, increased weather variability, and impacts particularly on the more vulnerable countries. Since staying below such a doubling would require far quicker and stronger mitigation than envisaged in most scenarios(some studies suggest such doubling is already unavoidable), adaptation will be required irrespective of the mitigation effort. 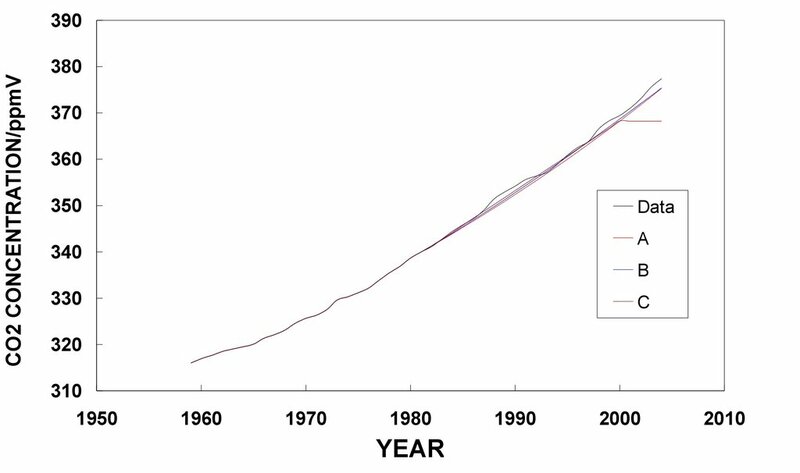 Conversely, a complete absence of mitigation or related efforts at sustainable development would imply that atmospheric concentrations and temperatures continue increasing towards the high impact and risk zones of Figure 2. The far greater impacts involved would then be much harder to adapt to, with higher risks of events which adaptation could not realistically ameliorate. The time characteristics vary greatly and this may be a crucial issue in integrated analysis. The main climate change benefits of mitigation actions taken in the short term (say within a decade) will emerge over decades. Where mitigation goes hand-in-hand with achieving other policy objectives there may also be short-term benefits. On the other hand actions to enhance adaptation to climate change impacts even in the short term will have consequences both in the short as well as medium and long terms (Kram, T., 2003). - The geographic characteristics are also completely different. Mitigating greenhouse gas emission will have global benefits regardless of where the actions themselves are taken. In case of co-benefits these will mostly be local. On the other hand the impacts of climate change on ecosystems and human systems will vary in severity from place to place. They will also vary with respect to the ability of the ecosystem or human community’s ability to cope (i.e. its adaptive capacity) with such adverse impacts. Some (but by no means all) the adverse impacts of climate change may be reduced by taking advance action (i.e. adaptations), but these will always be at a location-specific level. There is thus an inherent disjuncture between analysis of mitigation (local action but with global climatic benefits and local co- benefits) and adaptation (local in terms of both the action and its benefits/consequences). So, here again we ask, where is the learned and rabid comment upon this report which is the bases of the AR4 dealing with these issues. Reply now, or you will only have yourself to blame for a long series of postings on these issues. Uncertainties and Risk" by Martin Manning and Michel Petit which was commissioned by the IPCC preliminary to the AR4 and published in December 2003. • a suggested process for reviewing the treatment of uncertainty during the AR4 drafting process. Having got into the CO2 pit with the good Diplom Beck (aka Anon), Eli was idling his time away sucking Saturday beers and reading the CDIAC CO2 mixing ratio records. (Of course E has better things to do, why do you think he was looking at CDIAC data?) While there is much there with which to bedevil the good Diplom, a more interesting thought occurred. The decrease in seasonal variation as one moves north to south is obvious. In the northern hemisphere there is a great deal of land that blooms in the spring and summer. The large increase in vegetation which contributes to photosynthesis (and the warmer temperatures) noticably reduce the CO2 mixing ratios. The effect is most extreme in the far north. On the other hand, there is much less land and change in temperature during the year in the southern hemisphere, so the variation of CO2 mising ratios with the change of seasons is small. 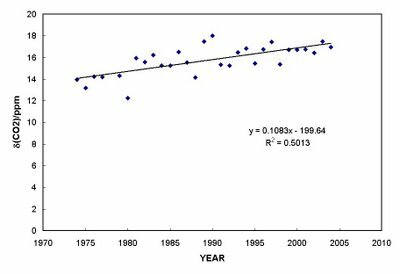 Apologies for these not being on the same scales, but wth, the point is that we DO observe a small increase in the difference between the maximum and minimum observed CO2 during the year. 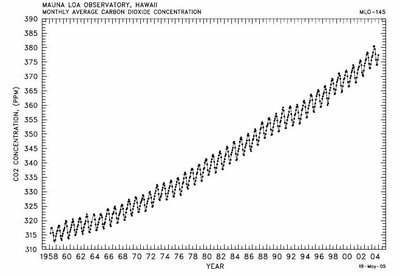 In the Mauna Loa (MLO) record, while the mixing ratio was going from ~315 ppm in 1958 to ~380 today, the seasonal difference increased about 1 ppm, from about 5 ppm to 6. 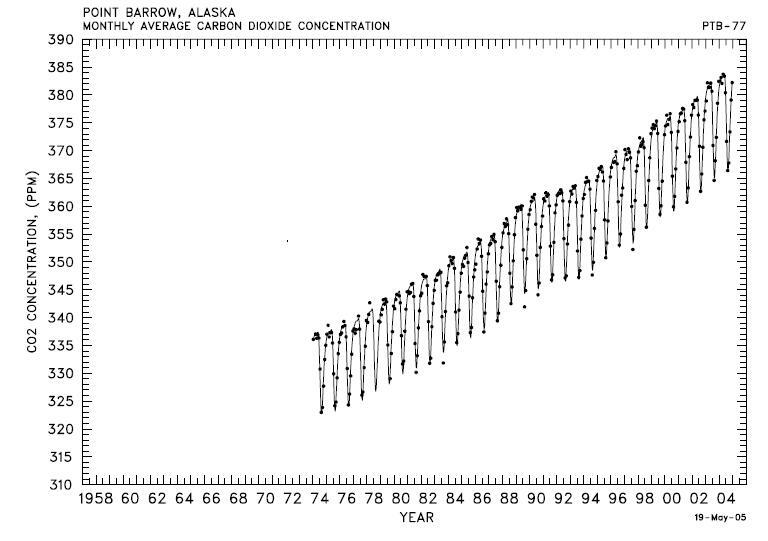 In the shorter Barrow record, the CO2 mixing ratio went from ~333 ppm in 1974 to ~380 ppm today, but the seasonal difference only increased about 3 ppm from ~14 ppm to ~17 ppm. In percentage terms the ratio of increase in the seasonal difference to the total increase is 1.5% for Mauna Loa and 6.4% at Barrow. So, those are the numbers, and we are left with the question of what they mean. Obviously, I would like to know if this has been considered in the past, but my first cut at it is at least provocative. It is taken as a given in carbon cycle circles that about half of the anthropically emitted CO2 is taken up by the biosphere and the oceans and the other half has resulted in the observed increase in atmospheric CO2. A favorite denialist claim is that plants will grow bigger, faster better with increased CO2. In some cases it is claimed that this will completely compensate for human emissions. Northern Hemisphere land vegetation accounts for relatively little photosynthesis, and this analysis sets some strong limits on it. This appears to conflict with studies that show a great deal of CO2 is taken up by Northern Hemisphere forests. Photosynthesis in the Northern Hemisphere evergreen forests accounts for most of the photosynthesis and does not depend strongly on temperature and time of year. Well there go the tree rings. There is a balance between increased photosynthesis in the summer and increased CO2 outgassing from the warmer oceans (and decay [added 10/8]). On net today photosynthesis at warmer temperature wins, but remember that vapor pressure increases exponentially with temperature. All of these have interesting implications for climate change. Anyone out there have more information or other thoughts. Uncle Eli has always admired astronomy, botany, and zoology as sciences with important amateur participation. By nurturing the large community of those interested in the science these fields have built important support groups, and amateurs have made important contributions. Many amateurs become obsessed with relatively narrow and previously trodden areas. Within those areas their knowledge often exceeds that of professionals. To Eli the most important thing is that people get to experience the joy of science. The smartest thing NASA ever did was reserve time on the Hubble for amateurs and some good science has resulted. What amateurs lack as a group is perspective, an understanding of how everything fits together and a sense of proportion. Graduate training is designed to pass lore from advisors to students. You learn much about things that didn't work and therefore were never published [hey Prof. I have a great idea!...Well actually son, we did that back in 06 and wasted two years on it], whose papers to trust, and which to be suspicious of [Hey Prof. here's a great new paper!... Son, don't trust that clown.] In short the kind of local knowledge that allows one to cut through the published literature thicket. But this lack makes amateurs prone to get caught in the traps that entangled the professionals' grandfathers, and it can be difficult to disabuse them of their discoveries. Especially problematical are those who want science to validate preconceived political notions, and those willing to believe they are Einstein and the professionals are fools. Put these two types together and you get a witches brew of ignorance and attitude. German biologist E-G Beck has assembled information from the scientific literature attesting to results of chemical determinations of atmospheric carbon dioxide by numerous scientists over the years 1820 to 1965. It is very interesting that many of these studies point to levels of carbon dioxide much higher than the IPCC preferred view of the evolution of carbon dioxide levels in the atmosphere. concentrations.''' Click here for a short discussion paper by E-G Beck. So, according to our motto, we went and RTFR. Here we will briefly summarize the paper and then point out why it is wrong, not only wrong, but a) the information Beck points to has been well known for a very long time b) the reasons for the earlier measurements being much higher than the current ones have been well known for at least 50 years and c) these problems were the original impetus for the Mauna Loa observatory (MLO) series. In other words, Beck is quite right about the measurement methods and quite wrong about their interpretation. Local knowledge can be very important. But actually, Keeling was very familiar with the measurements, as can be seen in a letter he published in Science [This is in the JSTOR archive so it should be available to most (Science 102 (1978) 1109)], and a history of the MLO CO2 measurements (UPDATE: Link rot. Here is another link to the history) that he wrote ~1980. Further, Beck is seriously overoptimistic about the accuracy and precision of the methods used before CD Keeling's introduction of the IR absorption method to quantify CO2 in the atmosphere. The best of the older methods in the 1950s could barely discern the seasonal cycle. Keeling's method, on the other hand did so easily with an accuracy of better than 1 ppm. Finally Beck (together with many of his sources) is seriously mislead about what constitutes an isolated observation site for CO2 measurements. Keeling found that even in La Jolla, on the US West Coast, if the wind was blowing from LA there were problems. Essentially all of Beck's sources made measurements in Europe, including such rural and isolated areas as Vienna, Kopenhagen, Paris, Rostock, Dieppe, Bern, Hamburg, etc. And if you measure in those rural spots that is what you get. 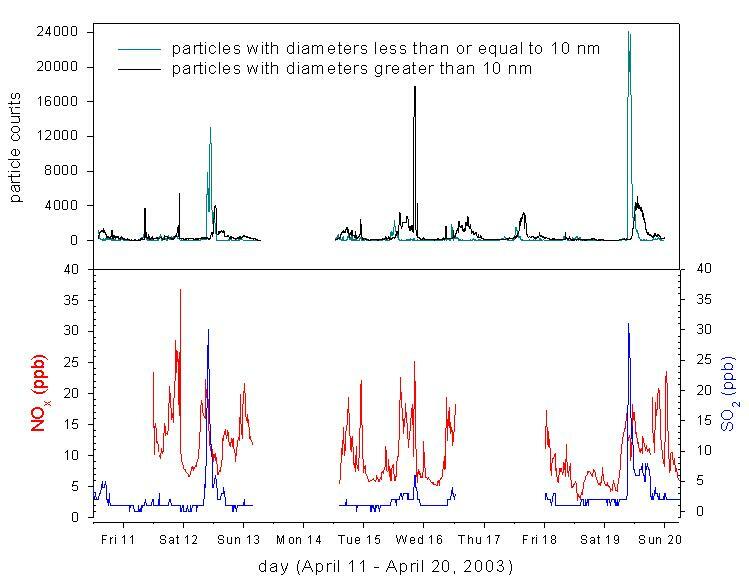 You also observe a huge variabilty between measurements which is characteristic of situations where air pockets from urban areas are floating by. Because he is pushing this particular peanut up Warwick Hughes' hill, Beck misses probably the most important of CD Keeling's contributions. True, his spotting that CO2 mixing ratios could be much more accurately measured by IR absorption was major, but even more important was the long series of measurements he made during the 50s and 60s in California, the Western US, Hawaii and Antarctica which made absolutely clear that there were only a few places on earth where one could measure CO2 without local interferences. that also explains why most of the measuring stations in the current CO2 network are mid Pacific. ...... it seems paradoxical that truly reliable data were not obtained by investigators who deliberately sought undisturbed locations to obtain baseline CO2 data. As Bray (1959) noted, several nineteenth-century investigators, who claimed analytical analyses accurate to 1.0 ppm, made serious attempts to obtain data representative of locally undisturbed air. I conclude that these scientists, perhaps from an inadequate knowledge of meteorology and atmospheric motion, underestimated the difficulty in finding truly uncontaminated sites. When their analytical and sampling methods failed to give them the high reproducibility that they thought they had attained, they ascribed the scatter to the atmosphere itself and not to weaknesses in their methods. In the first half of this century declining interest in atmospheric CO2 was kept alive by only a few investigators. The most notable was Kurt Buch of Finland, who concluded after many years of study that the CO2 concentration varied systematically with air mass. His claims (Keeling and Bacastow, 1977) that high arctic air had concentrations in the range of 150 to 230 ppm, north and middle Atlantic air, 310 to 345 ppm, and tropical air, 320 to 370 ppm, strongly influenced preparations for the IGY CO2 program, especially the Scandinavian program, which he initially supervised. When from inadequate chemical and sampling techniques the Scandinavian pre-lGY program produced CO2 concentrations in the same range as previous data, these new data were readily justified as resulting from different properties of the air masses passing over the sampling sites (Fonselius et al., 1956). How long would the findings of the Scandinavian CO2 network have been accepted if new manometric and infrared studies had not been begun? The Scandinavian data continued to appear in the back pages of Tellus until after the infrared analyzer results for Mauna Loa and other locations had been presented at the International Union of Geodesy and Geophysics meeting in Helsinki in 1960. But reform was on the way. Walter Bischof in 1959 had assumed responsibility for Swedish measurements. He soon became suspicious of their variability on the basis of discrepancies between ground-level and aircraft sampling (Bischof, 1960). Also, he had begun to use an infrared gas analyzer. With this abandonment of the traditional chemical method of analysis, the Swedish CO2 data ceased to include unreasonably low CO2 values. Then in 1960 Bischof turned to investigating suspiciously high values using aircraft to verify ground-level data. Probably within a year or two, considerably more accurate systematic data would have begun to appear from the Scandinavian program. But it is far from certain that a Scandinavian site as reliable as MLO would have soon been established. The Scandinavian investigators lacked the funds to embark on an ambitious continuous sampling program at a remote station. Many years might have passed before data of the quality of the Mauna Loa record would have been forthcoming. Indeed, high costs almost caused MLO to close down in 1964 in spite of its obvious value as a CO2 sampling site. 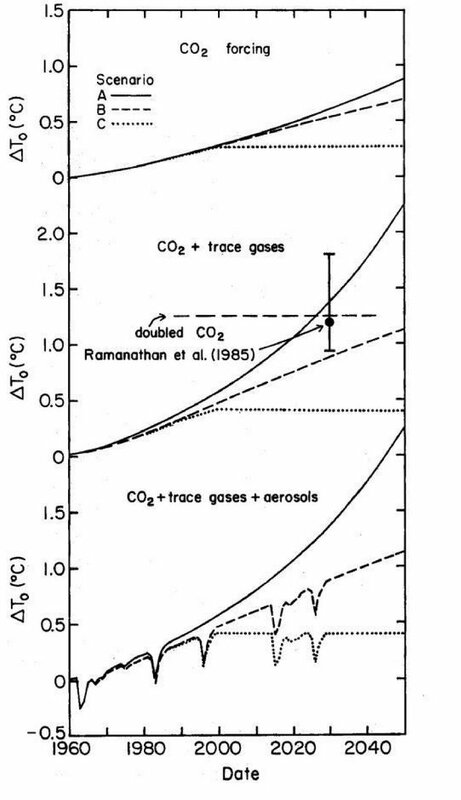 Disruptions under that threat of closure account for a serious gap in the CO2 record during the early part of 1964. Problems of cost also contributed to the decision to shut down the South Pole continuous analyzer program at the end of 1963. If these two remarkable sites had not already been established and yielded high-quality data before 1964, it is likely that the stimulus to start work at such remote sites would not have occurred for at least several more years because of financial impediments. 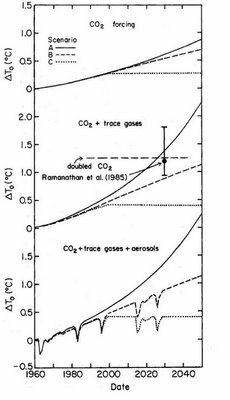 Thus it was a fortunate circumstance that Wexler and Revelle in 1956 saw the value of using the IGY organization to check out the possibility of near constancy in atmospheric CO2 by inaugurating a precise sampling program. We all recognize now that such a program is essential if we are to document adequately the rise in atmospheric CO2. UPDATE: Light editing added to kill off clunkers. Essentially this was written in the middle of a 24/7 experimental marathon. Apologies.